It is becoming ever more popular to give an experience gift, and this trend is a perfect match for tours and activities. There is a growing market for experiential gifts, especially among those aged 18-44 (Source: Wikipedia). An experience is seen as being more valuable than just accumulating more ‘things’. When your tour or activity becomes someone’s gift to a family or friend, this counts as an emotional purchase. When emotions are involved, buyers are less likely to restrict themselves to a budget (Source: Itchy Brains Central). People buy these experiences through experience gift retailers – websites that exclusively sell experiences to their customers. How can you jump on the experience gift bandwagon? Of course, you can use these offers all year round for birthdays. Remember that your (soon to be) customers need to feel like you’ve got exactly what they’re looking for. There’s a reason they are searching for a tour or activity like yours, so cater to it. For example, is it to relax? Is it for romance? Is to get an adrenaline rush? Or is it to have some lighthearted fun with friends? There are two main avenues of online distribution for your newly created experience gift packages. Make it easy for your customers to buy your product as a gift. Within Rezdy, this is easy to set up. Customer purchases Gift Card, Recipient receives email Gift Card. Customer purchases Gift Card, Purchaser receives email and gives to Recipient in person. You can even make it so that there is no expiration date for your offer. For full gift setup instructions, click here. 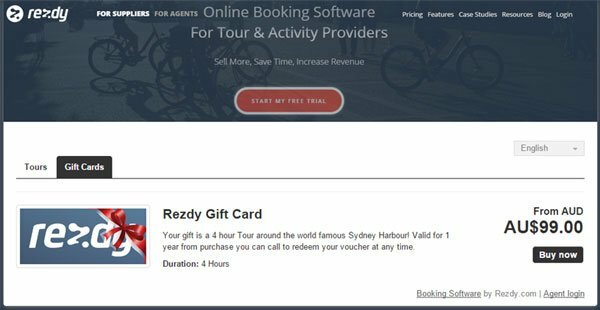 Partner with experience sites like Great American Days (in America) or RedBalloon (in Australia). They cater exclusively to people who are on the lookout for an experience gift – and they even separate their products into categories like gifts “for him” or “for her”. Rezdy connects directly with these agents, giving them access to your live inventory. This eliminates the need for double data entry and the risk of overbooking your tours and activities. Click here to see which online distribution agents you can build partnerships with. Last but not least, don’t forget to promote your new package by putting it on your home page and sending out marketing emails. Display it prominently on your home page as a banner. Tell all your distribution partners about the code (they may have it in their terms and conditions that you do not undercut their price on your site). Email all your past customers. Email all your new customers by including it in your reminder and follow-up emails. Schedule in social media updates promoting the offer (you can use Hootsuite, it’s free!). Click here for more tips on promoting seasonal campaigns.